When you first purchase our web based room booking software, you purchase a license for a maximum number of "venues" (rooms/bookable spaces) you wish the system to manage along and maximum number of individual user accounts required. Unless you initially purchase an "Unlimited" license, you may upgrade the maximum number of venues and/or user accounts on your license at any time as your operational needs grow. You can also upgrade your MIDAS scheduling system by adding additional databases to your interface. This allows you to run separate instances of MIDAS which all share a common login screen but each have a separate database. If you choose to upgrade to add additional databases to your license, it's important to note that the maximum user and venue limits that your system is currently licensed for are shared across all your databases - they are not "per database" limits. For example, if your MIDAS room booking system is currently licensed for a "up to 20 users" and "up to 30 venues", adding an additional database will not automatically double these limits to 40 users / 60 venues in total. You'll still be limited to a total of 20 users and 30 venues total spread across both databases. As user accounts themselves are unique to each database, if you wish a user to be able to have access to more than one database, they will require a separate user account in each database. 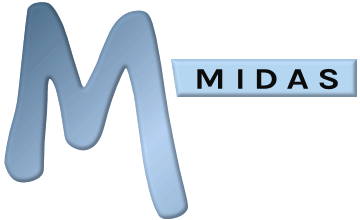 Therefore, if you're considering upgrading to add further databases to your MIDAS system, you may also need to consider increasing the maximum number of venues/users your booking system is licensed for at the same time.